Kettering Town made it back-to-back wins to maintain their place at the top of the Evo-Stik Southern League Division One Central with a 3-1 success at Potters Bar Town. The Poppies opened up a 2-0 lead in the first half thanks to goals from Elliot Sandy and Josh Moreman and substitute Gary Mulligan completed the victory with his first for the club after the hosts had pulled one back. Joint-managers Thomas Baillie and Scott Machin made two changes to the team that beat Beaconsfield SYCOB 2-1 in midweek with David Kolodynski and Josh Moreman coming into the team with Dubi Ogbonna and Claudiu Hoban dropping to the bench. 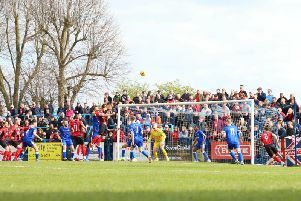 And the visitors made a good start with James Clifton sending a shot over before they took the lead on six minutes. Sandy advanced forward and then buried a left-footed shot into the bottom corner. Moreman went close when he headed over from Andy Hall’s cross after he had exchanged passes with Andy Gooding. Potters Bar threatened and it needed a fine header from Brett Solkhon to deny Joshua Oyinsan at the near post following a corner. And the Poppies took full advantage as they doubled their lead when James Jepson found Kolodynski and he flicked it into the path of Moreman who beat Mike Underwood from close range. The home goalkeeper was called into action when he saved well from Sandy after he produced a fine run during which he beat two players. Potters Bar threatened again before the break when Joe Bennett beat Clifton and Hall down the left but his cross missed everyone. Ogbonna replaced Kolodynski, who had been limping before the break, and the Poppies continued to create the better chances with Hall firing wide from Moreman’s cross. Sandy brought a smart save from Underwood while Richard Knight was called into action at the other end as he denied Josh Hutchinson with his legs and the turned another effort round the post. But the home side did get back into it with 18 minutes to go when Chris Doyle’s shot beat Knight and crept inside the far post. They so nearly equalised soon after when the ball broke for Tyler Hatherly who crashed his shot off the underside of the crossbar. And the Poppies took full advantage of that let off as they made it 3-1 with 13 minutes left. Mulligan, who had earlier replaced Sandy, was given time on the edge of the box and he drilled his shot into the net. Solkhon nodded over late on but another goal wasn’t need as the Poppies saw the game out to remain at the summit. Poppies: Knight; Clifton, Solkhon, Lee, Kinniburgh; Hall, Jepson, Gooding, Moreman (sub Robinson, 84 mins); Sandy (sub Mulligan, 72 mins); Kolodynski (sub Ogbonna, h-t). Subs not used: Hoban, Bukasa. Goals: Sandy (6 mins, 0-1), Moreman (25 mins, 0-2), Doyle (72 mins, 1-2), Mulligan (77 mins, 1-3). Bookings: Lee, Ogbonna (both fouls), Moreman (kicking ball away).